Jan 19, 2019 AddreessBook Aid is updated to 2.5.7. 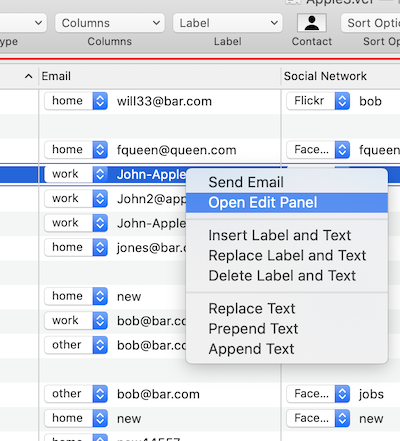 Add the context menu at the column header for selecting a way of sort. 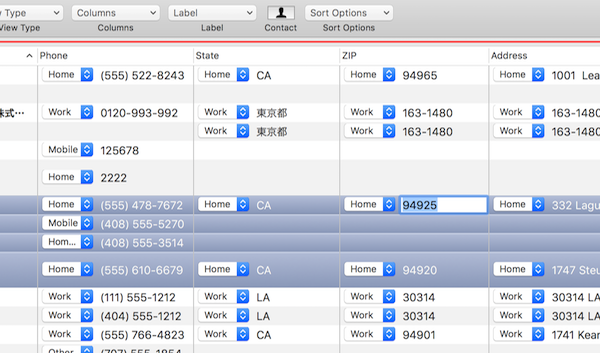 Add the function to replace the row order by a drag and drop in the contact detail panel. Change the label string from capitalize letter to small letter. Fix some minor issues to improve stability. 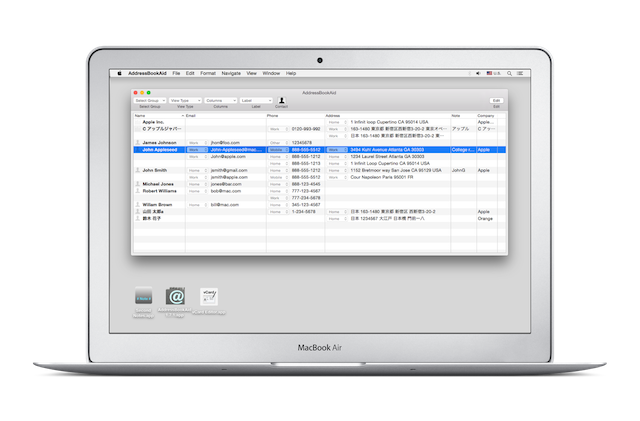 AddressBookAid is an application for editing AddressBook Database which is created by Apple Contacts. 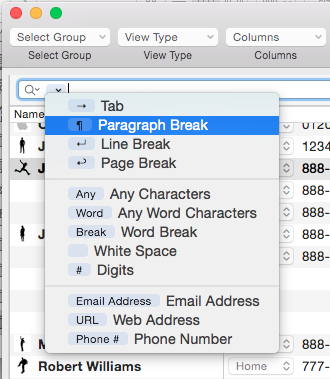 You can edit the AddressBook by the Table View, column sort and Find&Replace function by TextFinder. Your contacts are protected in your system. When AddressBook Aid is launched at first time, an alert for enabling access to your contact will be shown. Please allow AddressBook Aid to access your contacts, otherwise AddressBook Aid doesn't work. AddressBook Aid shows the AddressBook in the table view. You can select the data type of each column such as Phone, Email, Address by the View Type and Columns menu. If the data has a label, the label is shown together with the data, and you can change both label and value at the table view cell during editing. To edit the data, you need to click the edit button. Then the red line is shown under the title bar to show it is editing mode. And you need to double click the cell to change the value too. Each column in the table has a sort button. It will help you finding a duplicate data easily. The Sort Options menu is for sorting first/lastName in Name Column and ZIP/State/... in Address Column. When multiple address items such as a "ZIP" and "State" are selected by the Items menu, both column have the same label. But those are connected with each other. 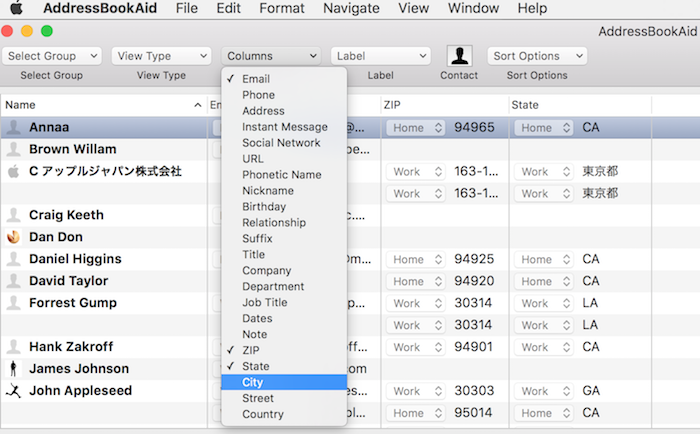 For example when you change the label of ZIP, then the label of State will be changed. 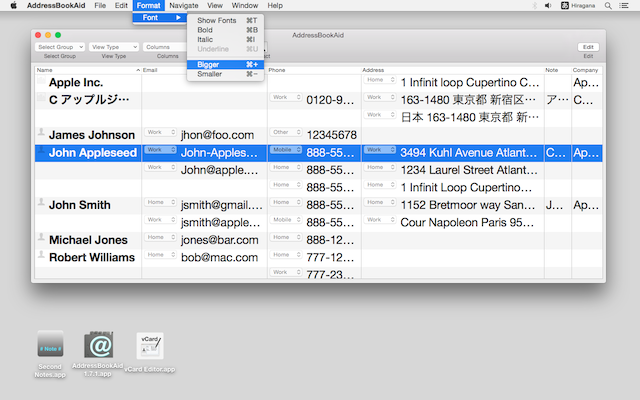 And AddressBook Aid uses TextFinder for Find&Replace which is introduced in OSX 10.7. You can find a word by name and by other categories with various options including a pattern, and replace it. Please note that the way of finding a string in the address is changed from AddressBook Aid 2.5.2. Before 2.5.2 the whole string in the address is used to "find", but now each item in the address is used to "find" a string. 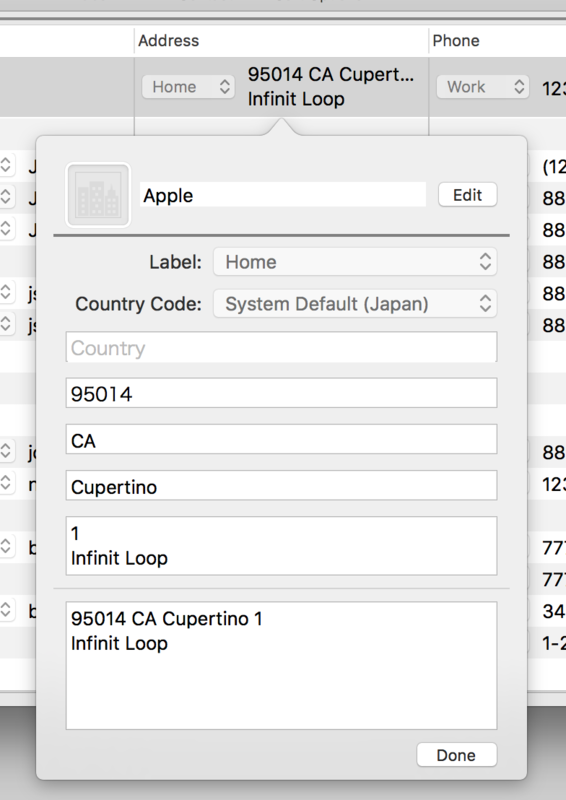 For example when State and City are "CA" and "Cupertino", you can not find "Cupertino, CA". However you can replace the string "Cupertino" or "CA". Before 2.5.2 the Address panel is shown when you click the "Replace" button in the Find&Replace bar. 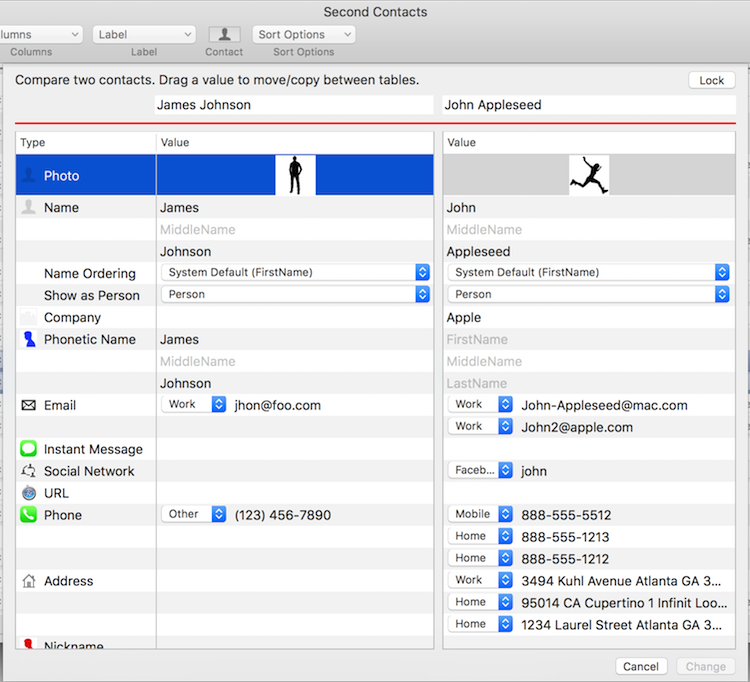 The compare panel is for comparing arbitral two contacts in the vertical table. In the edit mode, you can change the value and move/copy between contacts by drag&drop. In order to copy the value, dragging value with holding option key. You can set the same label or value in the selected cells at once. Select multiple rows, then change the value of one of the cell by double clicking the value. Then an alert is shown for making sure the operation. When you select OK, the values of selected cells will be changed as it is entered. When you control-click the cell, the context menu will be shown as below. Some cells have a action such as opening a mail message, a map which is depending on the type of the cell. When you ctrl+click on a cell in editing mode, the context menu of cells will show some editing menus. As the menu says, it is for replacing/appending/deleting text. 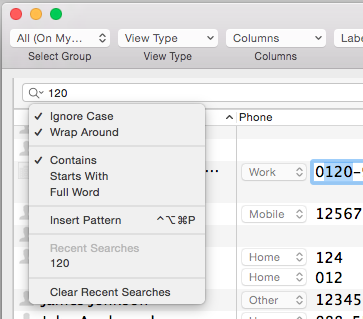 You can edit multiple cells at once, when multiple rows are selected. 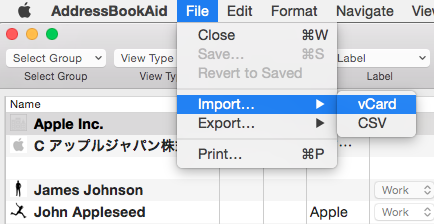 AddressBook Aid can import/export a vCard and CSV file. 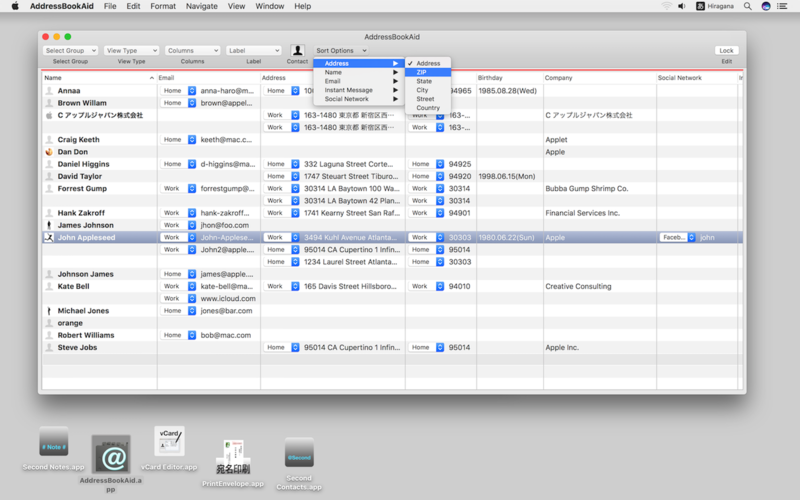 After select a file in the open panel, the import panel will be shown to show the contact information in the file. 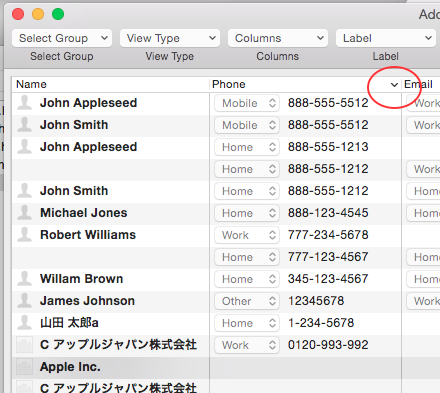 You can select contacts to import from it through the panel. AddressBook Aid can show QRCode of the selected contact with various formats, and you can Copy&Paste the image to other documents. You can change font and size in the row of Table. 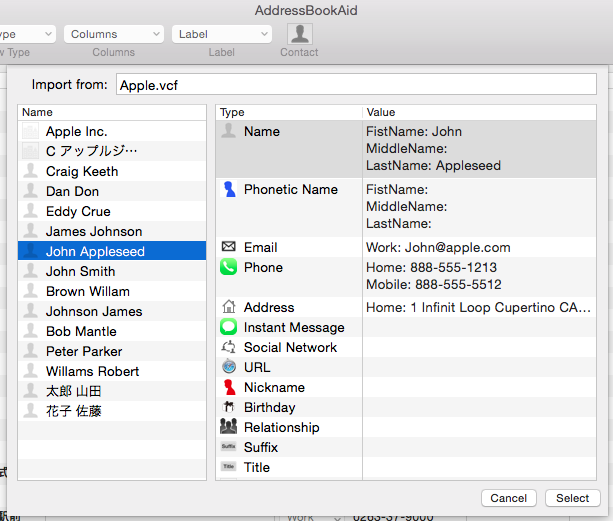 You can dra and drop contacts between AddressBook Aid and Apple Contact or Apple Mail. And when Groups are visible, Drag&Drop can be used to add a member to a group. 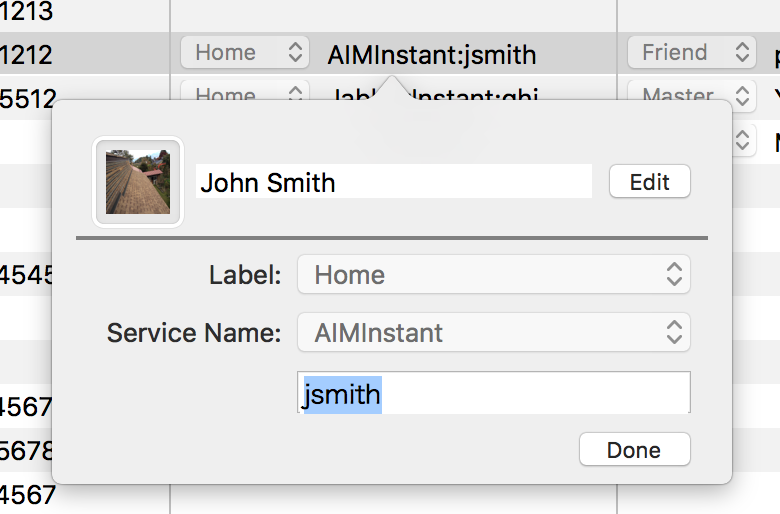 You need to click the Edit button before you drop contacts from Apple Contacts. 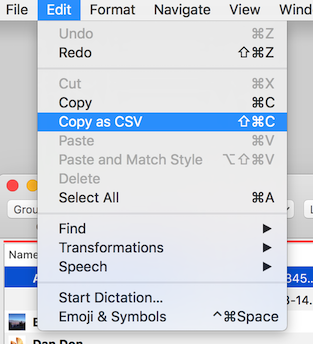 "Copy" and "Copy as CSV"
The "Copy" and the "Copy as CSV" menu in the Edit menu, are used to copy the select row as "Text" to a paste buffer. When you select the "Copy", items in the columns are divided by a tab, but when you select the "Copy as CSV", they are divided by a comma. So when you choose "Copy", you can paste the row in the table of Numbers or Excel as what you see. 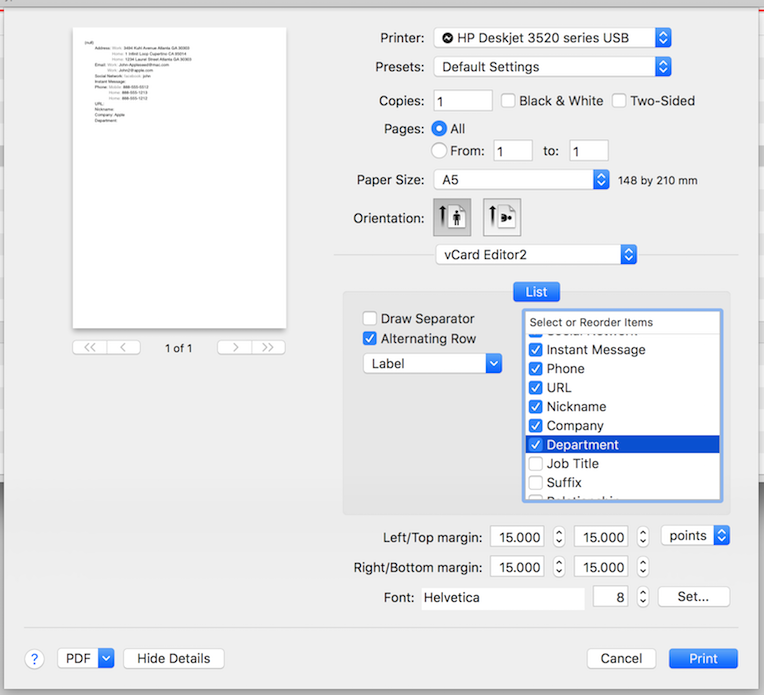 Select a contact and then select “Print” from the File menu. 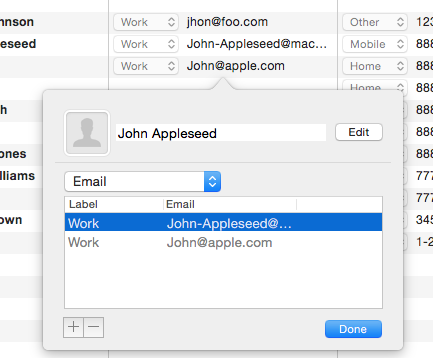 You can select multiple contacts by cmd-click. When you select the "AddressBook Aid" menu in the print dialog, the configuration pane will be shown for selecting a value to print. 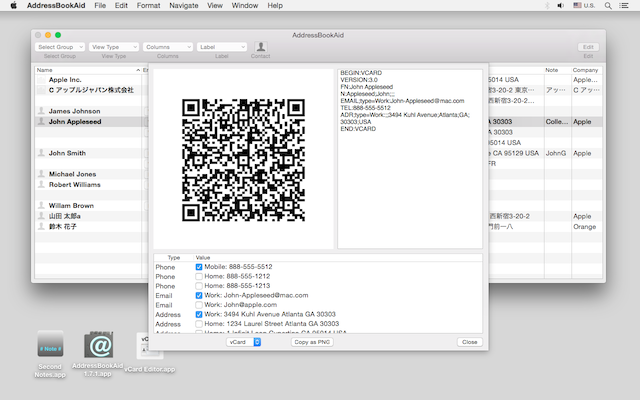 vCard Editor works in Mac OS X 10.7 and later. Double click on the zip file that you downloaded, then the vCardEditor-Trial.app is created. You can just delete this software from the installed folder in order to uninstall this software.